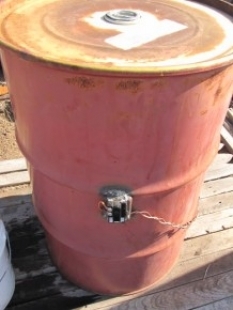 Homemade engine cleaning vat adapted from a 55-gallon drum. Features a thermostat-controlled heating element and utilizes a solution of 100% lye to soften and dissolve accumulated debris. Lye is easy to make using wood ash. Has to be hardwood ash. One of the Foxfire book's has lye making in it and I think they have covered it in The Mother Earth News A few times. No big secret or rocket surgery and as far as I can determine the powers that be haven't banned burning hardwood...Yet! You might be able to substitute washing soda for lye. It would be safer as lye is very caustic to skin and eye's. Try it out on part's that aren't important just to see how it works. Washing soda can be found in the laundry soap area of large supermarkets. I get it at Walmart. Washing soda is not the same as baking soda. Good luck! !